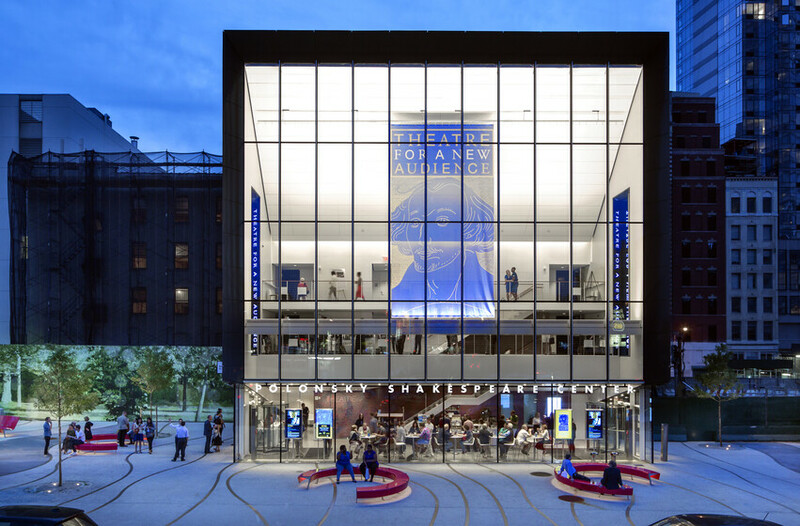 The Polonsky Shakespeare Center, Theatre for a New Audience is a 299 seat theater that incorporates sustainable design methods and utilizes the latest in energy efficient systems to maximize energy efficiency and create a healthy and comfortable environment for staff and visitors. Atelier Ten worked closely with the design team on the development of a flexible performing space which includes energy efficient high-performance systems for occupant comfort, triple-glazed windows that provide visitors with vast views of the Brooklyn Arts District and Plaza and a well day-lit entry lobby, and a careful selection of materials and finishes for reduced environmental impact and high indoor air quality. The result is an inviting and comfortable environment which supports the theater’s mission. Further, this LEED silver targeted building is expected to use about 35% less domestic water and 29.8% less energy than a comparable building.